This tart is delicious and not difficult to make – you just need to plan accordingly so the dough has time to rise and the good thing is: you can make it in advance and reheat it before serving. Dough: dissolve the yeast in the lukewarm milk and stir in 1 ½ tablespoons of the all purpose flour. Break the eggs into the large bowl of an electric mixer (attached with the dough hook) and lightly whisk them with a fork. Add the yeast mixture and the remaining all purpose flour and mix on low speed until very smooth. Add the sugar, salt and butter and mix well. Add the cake flour and knead on low speed for 5 minutes or until smooth. Transfer the dough to a lightly buttered large bowl, cover well with plastic and let rise until doubled, about 2 hours. Meanwhile, make the filling: chop the greens into 2.5cm (1in) pieces, discarding any thick stems. In a very large saucepan, heat the olive oil over medium heat. Add the garlic and scallions and cook for about 1 minute, until the scallions begin to soften. Raise the heat to high, add the chopped greens, salt and pepper and cook, stirring constantly, for about 1 minute or until greens are wilted (work in batches if necessary). Transfer the greens to a plate and let cool to room temperature. Taste for salt the stir through the nutmeg and pine nuts. Preheat the oven to 230°C/450°F. Line a large baking sheet with foil then lightly brush the foil with oil. Turn the dough onto a lightly floured surface and cut into 2 slightly unequal pieces: the larger one will be the bottom crust. Flatten the larger piece of dough onto an oval about 40x25cm (16x10in) and transfer onto the prepared sheet. Press the filling onto a colander, using your hands too, to extract the maximum water possible. Spread the filling over the dough leaving a generous 2.5cm (1in) rim all around uncovered. Roll the remaining piece of dough onto an oval about 37x20cm (15x8in). Place it over the filling and fold the edges of the bottom dough up over the edges of the top to seal the edges in the filling, then twist it, making a twisted rolled edge all round. 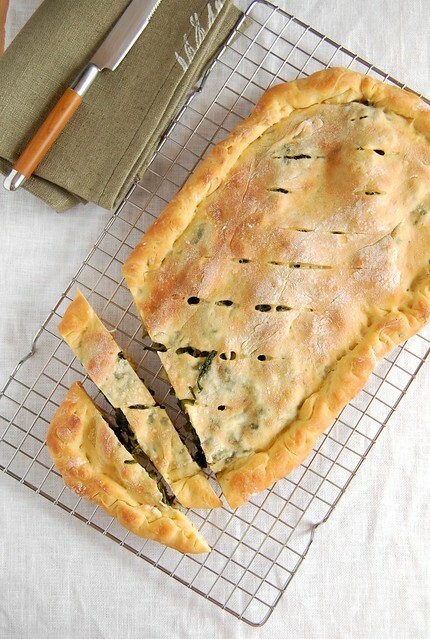 Use a sharp knife to make slits in the top crust. Brush with the melted butter (I forgot to do that). Bake the pie for 8 minutes, then lower the heat to 200°C/400°F and bake for another 8-10 minutes or until pie is deep, rich golden brown. Transfer the pie to a wire rack and cool for 20 minutes. Look at your going savory! What a beautiful meal. Looks tasty. I've always loved baked spinach... anything! I might have to try, thanks! Oh I do have to try this. It sounds divine and your photo is just gorgeous. I may use Kale and Beet Greens. Gorgeous, I love greens with nutmeg. i love pies with greens in them and i've made them quite a bit but this recipe looks quite different and really interesting because of the yeast based pastry..i'm really excited to try it as soon as possible..i'm just disappointed that i have none of my usual greens growing at the moment..although i do have a few of my own dandelions so i can add those to some bought greens.. I've never had greens with nutmeg but this looks and sounds so good!! The greeks make something very similar called 'hortopita' (literally, weed pie!) and it's sooo good but it's made with phyllo usually. Thanks for the recipe, I will remember to try this one!! Wat a prefectly baked pie, looks absolutely stunning and incredible.